This is a self-help guide to how to stop panic attacks. The best way to overcome panic attacks is to recognize panic attack symptoms and to train yourself to respond to them in accepting and calm ways. By escaping the panicking situation you don’t learn how to stop panic attacks, but in stead you learn that running away from your fear is a good thing. On the short run it is, but on the long run you’ll see that the panic attacks keep coming back. By using the AWARE method you teach yourself how to accept your panic attack symptoms and how to be patient and behave when you have a panic attack. Eventually you’ll be able to prevent yourself from having panic attacks as well. This page is created for those people who have mild panic attacks. For those who have severe panic attacks, we strongly recommend contacting a therapist. For those who do not know how to stop panic attacks themselves, we offer online counseling< for panic attacks and panic disorders. Contact us to schedule a first, free of charge, session. (Depending on your health insurance, treatment may be reimbursed). Acknowledge and Accept your anxiety. Online counseling for panic attacks. 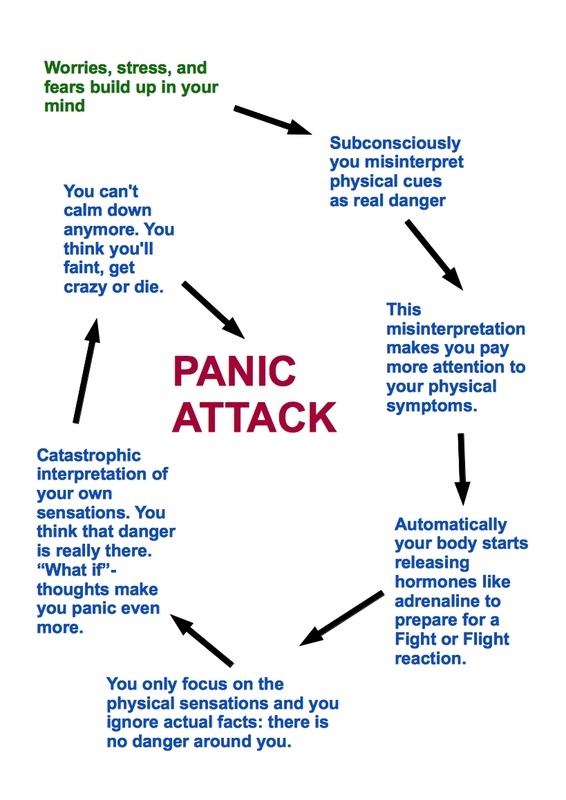 Knowing how to stop panic attacks – The AWARE method. Accept the anxiety. Don’t try to fight it, because it will not take away the anxiety. Watch the anxiety. Tell yourself which changes in your body and perception you notice and try to look at yourself as if you are an observer of yourself. Act normal. Breath normal and remain calm. Don’t try to escape because that will make you experience your symptoms even more intense. Instead, stay in the situation and experience the anxiety fading away. Repeat the steps 1, 2 and 3. If the anxiety is not reduced to an acceptable level yet, then repeat the steps. You’ll see that you’ll calm down soon. Expect the best. Practice makes perfect, so practice a lot. Don’t focus on what may happen to you, because that chance is really small. 1. Acknowledge and accept your anxiety. Knowing how to stop panic attacks starts with acknowledging and accepting your anxiety. You may be afraid to faint in the supermarket or to throw up in public, and it’s okay to be aware of this fear. But running away from or fighting your fear will only make things worse. Fighting or escaping your fears strengthens your belief that the fears are true and legitimate. But they are not. They are only fears and they make you sweat, your heart pound and so on. Thus: acknowledge that you are afraid and try to accept as much as possible that this anxiety is present at the moment. Remember that fighting the anxiety makes things worse, because your physical symptoms will increase in intensity (if you run away, your heartbeat goes faster and you start sweating). As you’ve read before and probably experienced yourself already: running away from or fighting your anxiety does not stop panic attacks for good. The anxiety may temporarily go away when you escape the situation, but so does it when you stay and wait. The difference between running and waiting is: by waiting you subconscious experience that the anxiety goes away naturally, without having to do much. By running, you falsely tell yourself that running away is the solution to the problem. So the second step in answering the question how to stop panic attacks is: Wait, Be patient. Allow yourself to experience your fear getting less and less. Look at yourself as if you are someone else and notice every physical experience. By now, you are almost there. You (partly) acknowledged and accepted your anxiety and you waited for the anxiety to become less. Now you can start focusing on anticipating upon the anxiety. There are a few techniques I would like to recommend to you. Breathing exercise. You can start with a breathing exercise during a panic attack. Breath deeply and slowly in and out for about 45 seconds. This breathing exercise tells your body to calm down. You’ll notice your heartbeat slows down, you stop sweating and so on. The breathing exercise takes away your physical symptoms. You can find detailed instructions for the breathing exercise here. Talk to yourself. Tell yourself what you’re experiencing. Talk to yourself softly and listen to your own words. By talking to yourself you create a distance between you and your feelings. And this reduces your anxiety as well. Don’t let yourself get carried away by ‘what if? questions, but focus on your physical sensations only. Focus on your body. Listen to your body and focus on the parts that are most tense. Try to relax and don’t forget to keep breathing. 4. Repeat steps 1, 2 and 3. The more you repeat steps 1,2 and 3, the sooner you’ll see your anxiety being reduced. Repetition is an important part of the solution to how to stop panic attacks. You get better in acknowledging and accepting your anxiety and you can anticipate upon them sooner and more effectively. If you do not see effect immediately, then please encourage yourself to keep repeating the previous steps. By now the panic attack should be almost gone. 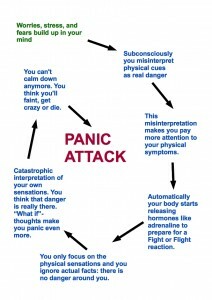 Just one more step to complete the self-help guide: how to stop panic attacks. Expect the best. Don’t think of possible doom scenario’s because their likelihood of coming true are very small. It’s better to focus on the success of this experience and to focus on what actually happens now, rather than what may happen if. ‘What if’-questions are very irrational and do not calm you down at all. In stead they make you panic even more. That is, of course, not what you want to happen during a panic attack (or right beore a panic attack).